Dr. Becky Morsch, director of Nazarene Health Ministry’s Community Based Health Care program in Papua New Guinea, was recently honored by the American Medical Association (AMA). Morsch is the recipient of the Dr. Nathan Davis International Award in Medicine, which “recognizes physicians whose influence reach the international patient population and change the future of their medical care,” according to a notification letter from the AMA. Morsch will be honored at an awards dinner on February 11 in Washington, D.C., and the Community Based Health Care program will receive a grant of $2,500. Missionary Carolyn Myatt started CBHC first in India and then in Papua New Guinea. The program was designed to meet proper hygiene and basic medical care needs for remote villages, where hospitals could not reach. The program trains local villagers – particularly women, to address their own health care needs through disease prevention, low-risk birth practices, and the use of prenatal care, as well as improving environmental contributions to illness. Morsch first began her work with CBHC as a short-term volunteer in Washim, India, at Reynolds Memorial Hospital, assisting Myatt. 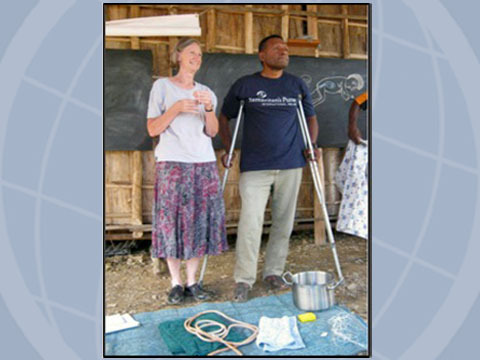 It was through this experience that Morsch realized her call to medical missions.